This post on workout tips for beginners is part of a campaign on behalf of Mom Central Consulting for Reebok. I received a Famous Footwear gift card to purchase a pair of Reebok shoes to facilitate my review and to thank me for participating. For years, my husband has been an avid runner. He runs in the rain, at 6 AM on a Saturday morning, and in 100 degree temperatures. Working out is vitally important to him and something he always finds time for. Personally, I struggle with finding the time and motivation to get out and exercise but I do it. Mainly so I continue to fit into my pants. My mom has struggled with her weight her entire life and I am determined to stay healthy, flexible and at a decent weight as I head through middle age. With two jobs and two kids I have to fit workouts wherever I can. 30 minutes of yoga in the morning while kids get ready for school helps me improve flexibility and get moving for the day. A walk after dinner with a friend gives me time to unwind from the stress of the day, reconnect with friends, and get my heart pumping. Taekwondo a couple times a week can be a brutal workout that really works up a sweat and when I have the time and energy I go out for a run. I try not to use being busy as an excuse not to exercise although it does still happen more than I would like. I am working on that! I recently got to work with Mom Central on a campaign for Reebok and Famous Footwear and I wanted to take this as an opportunity to provide some workout tips for beginners in case some of my readers really WANT to get started on an exercise program but just don’t know where to start. 1. Put working out on your schedule every day: Putting exercise on your to do list every day helps you develop a good workout routine. Every single day fit 30 minutes of exercise into your schedule. Depending on your day it could be a 30 minute workout tape before breakfast or a walk with the baby in the stroller after dinner. Every little bit helps! 2. Start slow: Don’t try to push yourself physically too hard, too fast or you will spend more time trying to recover from injury than actually working out. Gentle stretches, low impact, moderate cardio workouts are the best way to get started. Every few weeks try to push yourself a little bit more. You didn’t get out of shape overnight and you are not going to get back into shape quickly either. 3. 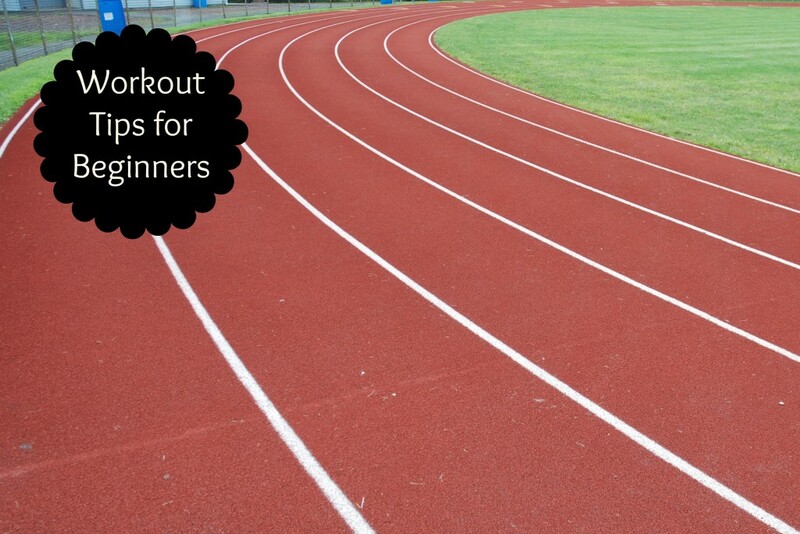 Create a workout playlist: My husband doesn’t run with music and I honestly have no idea how he does that! Music gets me moving and gives me the energy to keep going. Upbeat pop music is my usual music of choice and I really do find that I run farther and faster if I have my earbuds in and can tune out everything else going on around me. 4. Get the right gear: Buying top of the line exercise equipment doesn’t guarantee that your exercise routine will be successful but NOT having the right stuff will definitely make things more difficult. I have a pair of yoga pants and yoga top for my morning stretching routine that makes it easier to bend and stretch in comfort. A lighted cap for night time walking helps keep me safer in my neighborhood and a good pair of running shoes like the Reeboks I got from Famous Footwear help me put one foot in front of the other comfortably when walking or running. 5. Don’t forget the cool down! Everyone seems to remember to warm up before they work out but a lot of people forget the cooling down process. If you are working out hard, remember to add 5 or 10 minutes to the end of your workout routine to get your heart rate back to normal and bring your body temperature back down to normal. Your recovery will be easier if you remember to add a cool down session to your workout routine. When I was asked to partner with Reebok and Famous Footwear for a review I started browsing the website and was thrilled to see that the prices were so reasonable. With the $100 gift card I was provided and an additional discount code I found online I not only got myself some running shoes but also got my daughter a stylish pair of cross trainers and my son a desperately needed pair of flipflops. 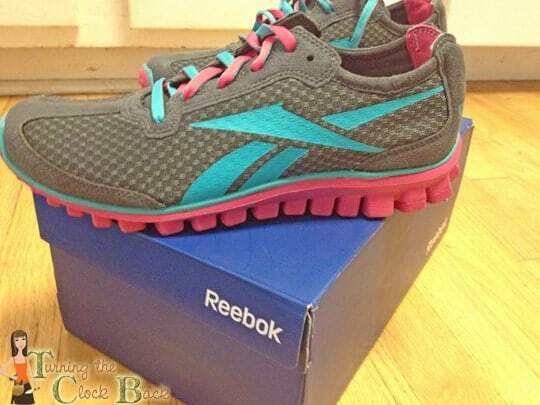 I chose the Reebok Women’s Realflex Run sneakers for myself. They come in a couple different color choices but I went with the grey/teal/pink combination. This is a very lightweight running shoe that has a padded collar around the top edge. It has a cushioned foot bed and very flexible sole. The grips of the sole extend slightly up the toe and up along the heel to provide better traction when you are in a running stride. So, what did I think of the pair of running shoes that I received? I was really surprised at how lightweight these shoes really are. The material along the sides is thin but their is plenty of support along the back of the shoe and around the toe. They seems to run true to size, although maybe a tad bit narrow. Length wise they were perfect for my foot, which is nice since sometimes buying shoes online can be tough! These shoes are very comfortable and seem to have plenty of padding. I think I might like a tad bit more arch support but I have really bad arches and sometimes have trouble finding shoes that provide just the right support. I certainly found them to be very attractive and comfortable. I really like the lightweight, breathable material since it makes it easier to dry them out after a particularly sweaty workout for for those days that it is really wet outside. The Reeboks that I bought my daughter were the Women’s SUBLITE which are more of a cross trainer than a running shoe. Since she plays tennis and will be starting volleyball soon she needed a shoe that would provide good support no matter what sort of activities she is doing. They will also be an everyday heading off to school shoe so she wanted them to look ‘cool’ and be comfortable. These shoes fit perfectly for her, are comfortable, and hip enough that she feels cool wearing them to middle school every day. They are a tad bit heavier than the running shoe that I bought for myself but still have plenty of flexibility to them. They are the perfect combination of everyday shoe and workout shoe. I haven’t had Reeboks in a few years but was really impressed with the shoes I received to review. It is important to have the right shoes to get started on your workout routine and I think the ones I got from Famous Footwear were a good choice. I hope these workout tips for beginners will help you get started on your own exercise routine and if you need a good pair of shoes I recommend you check out Reeboks and Famous Footwear to get started! Love the idea of a playlist. Music can be so motivating!